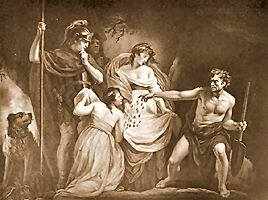 TIMON, ALCIBIADES, PHRYNIA, AND TIMANDRA. Tim. Warr'st thou 'gainst Athens? Alcib. Ay, Timon, and have cause. Tim. The gods confound them all in thy conquest; and thee after, when thou hast conquer'd! Tim. That, by killing of villains, thou wast born to conquer my country. It is her habit only that is honest. Painted by John Opie, R.A. Engraved by Robert Thew.